Buy Raw Health Organic Raw Sauerkraut - 410g in the UK from our online shop or directly from our independent Scottish store. 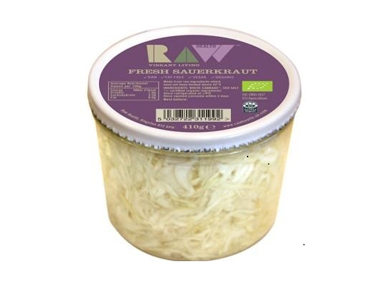 This raw sauerkraut is unpasteurised organic sauerkraut containing lacto bacteria. Mildly flavoured with a crisp, crunchy texture. Unpasteurised organic sauerkraut containing lacto bacteria. Mildly flavoured with a crisp, crunchy texture. As an unpasteurised sauerkraut, this product requires a special lid to allow it to continue to ferment. We recommend using a round tipped knife or similar utensil to lever up the edge. It should then be possible to peel off the lid. Another one of my favourite Dutch recipes. I make my own sauerkraut, but back in the Netherlands you could buy fresh sauerkraut from a fermentation bin. I doubt if you still can though... If you don't use all the sauerkraut, just keep it in the fridge and it will last for ages. This recipe contains 250g sauerkraut. Tasty way to use your (homemade) sauerkraut. Sauerkraut has lots of health benefits, besides that it's also virtually fat free. This recipe contains 1.5 jars of sauerkraut (total 600g). Sauerkraut is fermented white cabbage as opposed to pickled and shouldn’t contain vinegar. It’s the lacto-fermentation which makes sauerkraut such a healthy vegetable. Sauerkraut is high in digestive enzymes, fat free, cholesterol free and high in vitamin C. It is also quite high in sodium, so should only be eaten in moderation by people with high blood pressure. You can reduce the sodium by rinsing the sauerkraut before cooking. This recipe contains 500g Raw Health sauerkraut, drained. You can add meat to this dish, but the lentils are sufficient as a meat replacer. They are high in protein, fibre and iron and a range of different vitamins and minerals. Low in cholesterol and low in calories, lentils are a indeed a very healthy replacement for meat. This recipe contains 500g sauerkraut, drained. Another dish which uses sauerkraut. Sauerkraut can be eaten year round, but is more of a winter vegetable as it is preserved white cabbage. This recipe contains 500 g sauerkraut. We sell real Raw Health and other Spreads, Sauerkraut & Yogurt directly from our shop in Scotland and online throughout the UK. View more products from Raw Health. Where can you buy real Raw Sauerkraut safely online? If you are wondering where you can buy Raw Health Organic Raw Sauerkraut - 410g safely online in the UK, then shop with us. We are an actual health foods shop; with real people selling real foods and products. Our award-winning independent shop is located in Stirling, Scotland since 1976. You can buy our Spreads, Sauerkraut & Yogurt in store or safely place an order with us online or over the phone. Raw Sauerkraut - Raw Health Organic Raw Sauerkraut - 410g in Spreads, Sauerkraut & Yogurt and Chilled Foods.